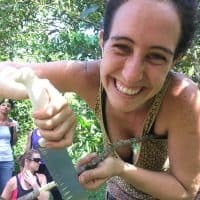 What Does It Mean to be Part of a Mushroom-Loving Intentional Community? Being a part of our community means we live, work and play in a environment of respect, integrity and love. 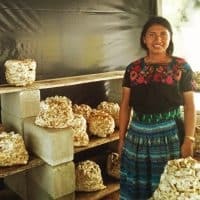 Members of our community may have varying levels of knowledge when it comes to mycology but we all share a love for mushrooms, whether that is medicinal, culinary, earth-saving or soul-loving. Intentional also means that we live with a consciousness of our impact on each other, on the community around us and the beautiful environment that we inhabit. We do our best to live in accordance with permaculture principles, maximizing use of our natural and renewable resources while reducing the amount of waste we produce. We have a core team and are supported by a constant stream of wonderful learners, teachers, travellers, free-spirits, lab-geeks, artists, cooks, photographers, builders, breakers and MORE! We welcome everyone and encourage all to participate in the fun! What Are My Options for Staying/Visiting? You can visit Fungi Academy as either a Guest, Volunteer, Intern, or just a visitor at any time. It is best to contact us in advance so we can anticipate your arrival and ensure that we have a spot ready for you. We also ask volunteers and interns to submit an application form to gather some basic details. If you are unsure about staying, you can always visit us and we will be happy to show you around. We also offer a Mushroom Workshop open to the public every Tuesday from 11am – 2pm at a minimum contribution of 200Q. What Can I Expect as a Guest? A guest stay at Fungi is a great experience enhanced by the spectacular view. Guests are not expected to work and are welcome to enjoy the communal breakfast and lunch included with your stay. You will also have access to all of our communal areas including the studio and yoga platform, as well as our awesome collection of books available to borrow during your stay. Typically, as a volunteer you can expect to work five days a week (Mon – Fri) between the hours of 9am – 2pm. There are exceptions if you are working in the kitchen or if there is a course running. Your contribution (50Q per day) includes 2 meals, accommodation, and wifi use. In terms of work, of course, certain basic tasks need to be fulfilled in order to keep our community running. This includes cooking, cleaning, and tending to our chickens, for example. Volunteers are expected to participate in these shared tasks throughout the week and they normally amount to a small portion of your volunteering time. Outside of the core tasks, we do our best to match volunteers to the particular skill set they bring or desire to learn; we always have a variety of tasks and projects on the go. Projects may include garden work, land/building maintenance or repair, art projects, and much more. Volunteers have free time every afternoon and weekends to enjoy on the property or visiting other areas on the Lake or beyond! What Can I Expect as an Intern/Apprentice? What Are Some Things I Might Want to Pack? What Are Your Options for Sleeping/Accommodation? We currently have beds available in dorm rooms on a first-come, first-served basis. There are also tents available or space for your own tent setup if you like. If you would prefer a private room, we have one available – please inquire on availability. Prices vary depending on whether you are volunteering or staying as a guest. The current rate for volunteers in a dorm room is 50Q per day; for guests the cost is 100Q per day. The rate for staying in a tent is 90Q per day for guests. A private room is 160Q per day. Of course! We serve two vegetarian communal meals prepared by volunteers on the weekdays. Breakfast is served at 8am and lunch at 2pm. Both volunteers and guests are welcome to the kitchen and communal supplies to prepare meals on the evenings and weekends, as desired. Please be mindful that community supplies are limited and you may want to purchase certain items for your personal use (e.g. coconut oil, peanut butter, or honey). Please also purchase your own items for snacking. Do I Need Any Shots/Vaccinations Before Arriving in Guatemala? For the most up-to-date and accurate information you may want to check travel guidelines online – the CDC in the U.S. for example. The most common illnesses in Guatemala are usually water-borne and so we advise to bring a good water bottle (we have UV-filtered water) and be particularly aware of sources of contaminated water. I Don't Like Bugs, Should I Worry? We would advise you not to worry! We do have an assortment of critters that may be present around the property however most are harmless. The most common insects you will encounter here are spiders (they will generally avoid you), bees, and mosquitos which are more present during the rainy season – bring repellent if you are sensitive to bites. On some occasions, you may encounter scorpions; they do sting (OUCH!) but are not poisonous. What Kind of Clothes Will I Need for the Climate/Weather? The weather in Guatemala can vary depending on whether it is the wet or dry season. The dry season can get quite hot though there is often a nice breeze passing across the lake and nights can get cool – bring a sweater if you get chilly easily. In the wet season, the weather is slightly cooler and there may be rain for hours on end (or even all day!). It is advisable to bring a good pair of boots, some warmer clothes, and a rain jacket. What Kind of Activities Are There To Do Around the Lake? There is plenty to do from amazing sunrise hikes up a nearby volcano, to swimming or paddle-boarding out on the lake, or even taking a course in Spanish, cooking, yoga or more! You will find lots of variety in San Marcos or the other communities around the lake. Bring a smile, bring your heart, and be open to an amazing experience with an awesome group of people!